Happy Sunday everyone! Canada Day is fast approaching and just last week I decided I would be going out to celebrate. My girlfriend and I are thinking of checking out Granville Island first as they're hosting a Canada Day Parade and Fireworks. As many of you may or may not know, Granville Island is a huge hotspot for Vancouver Tourism and entertainment, so if you ever decide to visit beautiful Vancouver, I'm sure that's where you'll end up:-). I believe the last time I was out for Canada Day was about 4 years ago - Yes, it's been a while. I went on a Canada Day boat cruise with a few friends and my girlfriend and I wore matching outfits - see below, if you want to see how silly and in the spirit we looked. However, this Canada Day I thought I'd go with something a bit less flashy:). I found these fun and funky white earrings with tassels at H&M recently - They're a great statement piece for this outfit as the outfit is quite simple. I decided to pair this look with a low white wedge sandal since will most likely be doing quite a bit of walking. I wore these sandals all day today and they're super comfortable. Definitely a great find! Thank goodness. (Canada Day Boat cruise photo that I got dressed up for back in 2011 - Don't judge;). What's everyones plan for Canada Day or Independence Day? You guys look like you had tons of fun in 2011! Love your look now, especially those earrings! H&M always has great accessories if you can make it through their crazy messy stores. Happy Canada Day! Thank you so much Angelina and yes this is so true! However, I do find H&M to be a lot easier to manage than Forever 21 - That store is always a zoo and I tend to give up after 10 minutes of being there, so messy. Thanks Karen! Tomorrow is the big celebration, so I will be heading out then:-). Thanks Rachel! Definitely perfect for how hot it's been here.. not complaining though! :d.
Thanks so much Vivian! 2011 was fun as my gf and I got to make matching costumes;). Really looking forward to tomorrow:-). You look great in this outfit for Canada Day! 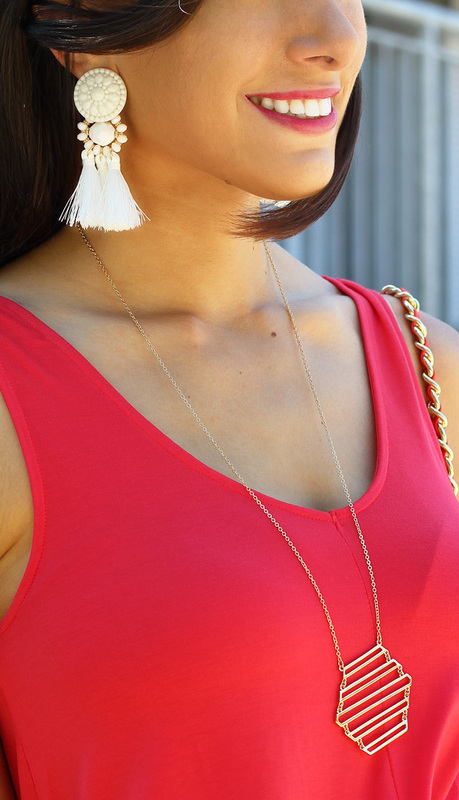 Love the tassel jewelry on you and this color really pops. I think your outfits from last year are really adorable. Love it! I am loving this outfit - you look stunning and the colour suits you perfectly!!! It's a simple outfit so it's perfect for the warmer days but it still has this really elegant feel with all the gorgeous jewellery that you've teamed it up with!!! In love!!!! Thank you so much Layla! Sometimes the simplest outfits are the best, especially paired with the perfect pair of earrings:-). I love those white earrings! What a great find. I have been on the hunt for a pair of white shorts for some time. This is great summer look. Was a total blast back in 2011! This year was also fun, just somewhat more calm ;) Hope you had an awesome 4th of July! They definitely are! Such a great find at H&M. Thanks for stopping by Rena! Love this look!! You look amazing!! And those earrings are gorgeous!! You look stunning! Love how this outfit just pops, but is simple and chic at the same time. Love the tassel earrings too. Such a fab statement piece! I think its going to be raining here on Independance day, but hopefully we'll still be able to do a small cookout with family. Thanks so much Amanda! They definitely make this outfit:-). Hope you had an awesome 4th of July celebration. You're rocking those white shorts perfectly, such a babe! I'm so jealous I can't be in Vancouver to celebrate with you guys (I did American studies back in Poland and Canada's history was always my favorite, even once I did a presentation about British Columbia and wanted to come there ever since!). Love your country! Paulina! You will definitely need to come visit Vancouver and I can take you around. Would love love for you to come visit one day. Hopefully you can make it out here, you little travel bug:-). You look amazing and I love the red and white on you! This would perfect in the US for the 4th:) I just need to add a little touch of blue. Such a great post! nice photos.. looks that you had a great time!! Hahaha thanks Lauren! It was definitely a good time:-). Hope you had an awesome 4th of July! ps. you SO suit red lipstick! You look stunning, that tank top colour really suits you. You look amazing! Love the color of the tank top! Thanks Jane! Hope you had an awesome weekend:-). Thanks Trou. We actually missed the fireworks, but we did make it to the Granville Island celebration:-). I'm in love with your outfit! Your jewellery is so gorgeous!!! Thanks Carissa! I just love my accessories:-). Glad to have you back! What a gorgeous look! That red top is so pretty on you, and I love those earrings! I hope you had a wonderful time! Thanks so much Jessica:-). It was pretty fun!